From Kerrville we drove to Fredericksburg (German tourist town) and had breakfast at at bakery. An hour into San Antonio brought us to the Alamo. 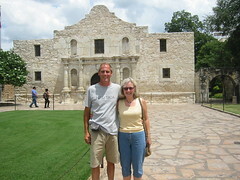 We enjoyed it a lot, learning some Texas history. (Sorry Pete, there was no basement) We spent the rest of the day on the river walk. We walked over six miles, hitting every part of the river walk. It was very hot, but we enjoyed it. We stayed in our first motel. We weren't too anxious to spend a night sweating in the back of the van. I cannot believe you two....well we are back and I just got caught up with your blogging. You slept in your van in Texas in a campground with all of the doors open....you guys are crazy....we can handle our friends losing thier van but we could NOT handle losing our friends....be safe you crazy explorers!!! !We would love doing this with you sometime but we would cop out and get the motel...yes you could come and use the shower.